A woman was found beaten to death with a hammer on a neighbour's bathroom floor after going for her regular evening stroll, a court has heard. 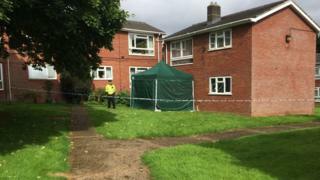 The body of Farnaz Ali, 49, was found inside Danny Williams' flat in Godric Place, Norwich, in July last year. She had lived opposite Mr Williams, 27, who denies a charge of murder. Ms Ali had voiced concerns over Mr Williams playing loud music, but it was "unclear" why she had been killed, Norwich Crown Court was told. Prosecutor Andrew Thompson said Ms Ali had died from "multiple blunt force impacts... consistent with a hammer" to the head, and compression of the neck. A blood-stained tissue had also been found "wedged" at the back of Ms Ali's throat. Her body - with 59 sites of injury - was found by police in Mr Williams' bathroom on 29 July 2017. Officers broke in after receiving calls from Mr Williams' father and a friend concerned he had hurt or killed a woman in his flat, the jury was told. Ms Ali had been reported missing the night before by her partner after failing to return home. She had shared her concerns with him earlier that day about the music coming from Mr Williams' flat, the jury was told. On the evening Ms Ali disappeared, Mr Williams arrived at a friend's flat in Lowestoft with two bags and started to "ramble". Mr Thompson said the defendant told friends "various snippets", including that he had killed a woman and had left her body in his flat. He then started a fire in the garden, burning his holdall, said to have contained a hammer and piece of carpet, the jury heard. The victim and defendant "barely knew each other" and the circumstances of her death "were unclear", Mr Thompson said. "She popped out for a walk at about 19:00 - as she was in the habit of doing - and she was never seen again." A mutual neighbour saw Ms Ali "close by" Mr Williams at about 20:00, but said he did not spot anything "untoward". Mr Thompson also told the court Mr Williams was said to have had health issues as a child and learning disabilities.